Tis not easy, that sort of approach is more suited to spoilers than for (what my old school mind calls) lj-cuts. I chose my link wisely. 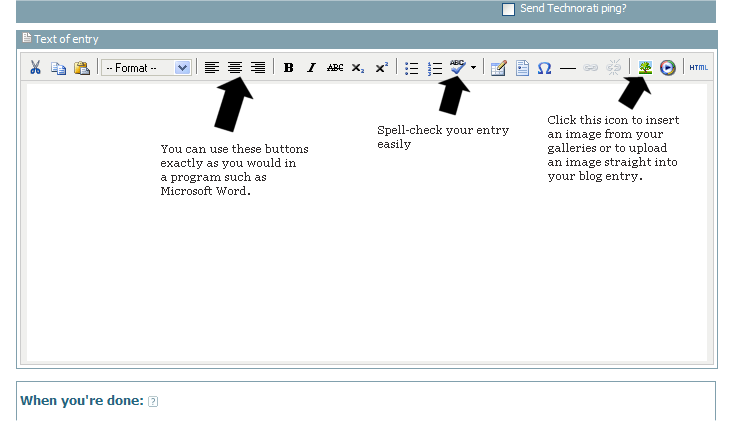 Like the new features, although when using the WYSIWYG editor and then clicking ‘Preview’, nothing comes up. As WYSIWYG doesn’t actually do what it says (doesn’t include my blog’s style sheet), Preview would still be handy. Also, spell check crashed Firefox. Good stuff though, seems like significant changes afoot. You can put this in your custom css, it’ll make the new entries have a bold link and the read entries to have a… non-bold link. The advantage being that this method works on any blog theme, not just a specific one. Just tried the new editor this afternoon and discovered that the image insertion function doesn’t seem to be as useful as that in the textile editor. There didn’t seem to be an obvious way to insert a thumbnail that links to a bigger version, unless I missed it. Is there any way you could make the editor selectable from the “Create” screen? Could you elaborate on making the editor selectable from the “Create” screen? What I’m really asking for is an easy way of selecting which editor to use for a new entry. Having to change the blog settings each time is too inconvenient. For as long as there are features that work well in one and not the other (like inserting images) it would be useful to set the default as whichever works for you most of the time, but be able to easily select the other when you need it. I did have in mind being able to select from the “create entry” screen, and I did realise that that would mean discarding any existing content. A “do you really mean this” pop-up should be warning enough. You could also make the select inactive once content exists in the text box, I guess. I never use the higher level create screen, always choosing the relevant entry from the menu, but I could live with having to go through that screen if I wanted to switch editors. On the assumption that ultimately both editors will do all things equally well so there should be no need to switch like this, it seems better to go with the easiest solution. There didn’t seem to be an obvious way to insert a thumbnail that links to a bigger version, unless I missed it. All of these issues are fixed for the next release of BlogBuilder, as well as adding a blockquote button (not sure how I missed that). You will be able to switch from one editor to another on the edit screen, but beware that there may be a loss of content (though this has been minimalised). There’s also new features, of course. Yay! The FAQ link above to Google Analytics would appear to redirect to the general FAQ page. Has this been pulled? Could we have a “report a comment” feature? I had a particularly offensive comment posted to my entry of 10 July 2006, and whilst I have since deleted the comment, I feel that I should I have been able to report the user’s IP address (86.29.30.90) as well. If you continually get abusive comments, you should report them to blogs@warwick.ac.uk – if it’s just one or two, they should just be deleted. Trolling is an unfortunate consequence of the Internet. So what about the case where a user find a comment offensive but the author doesn’t? Is it for the offended to report the entry, or email admin with regard to the blog, or contact the blog owner? The stance we have taken is that each user is responsible for the comments on his or her own blog. If another user is offended by those comments, they should go to the blog owner. Thanks for the tip, Mat, I’ll bear it in mind for the future.